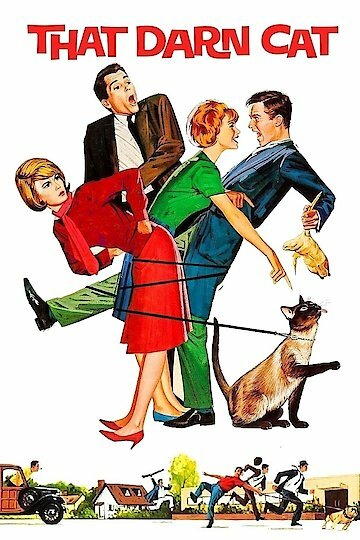 This film is based on "Undercover Cat," by Gordon and Mildred Gordon. D.C. (Darn Cat) is a venturesome Siamese tom, whose curious nature always gets him into trouble. He lives with teenage Patti and her older sister, Ingrid, Inkie. The young women are alone while their parents are vacationing abroad. While roaming the neighborhood, D.C. trails a bank robber to an apartment where the bank robber and his accomplice are holding a bank employee, Margaret Miller, hostage. Miss Miller replaces D.C's collar with her watch, hoping that when the cat leaves, whoever finds the watch will come to rescue her. More Like That Darn Cat!